The Harbinger is lost, sunk to the bottom of an otherworldly sea. Every soul that ever died and was protected within its hold has been lost along with it. But at least that precious cargo is out of reach of the demon Urcena and her army of soul-devouring monsters. The soul keepers are broken, scattered, and barely clinging to existence without their ship or any way to collect or protect the souls of the newly dead. If they are to have any hope of stopping Urcena's horrifying plans to destroy the fragile balance between living and dead, they will first have to survive long enough to locate the ghost of one of their own, who sacrificed himself to save the rest of the crew. 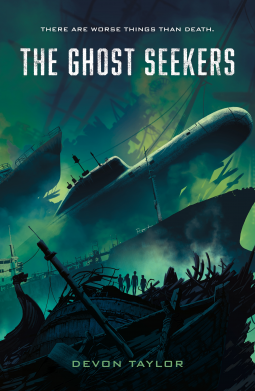 Devon Taylor's cinematic and pulse-pounding duology comes to a thunderous conclusion in The Ghost Seekers.